Porcia: I had never seen the ocean in my entire life. Jenn: Where did you grow up? Porcia: I grew up in Nepal, and this is the first time I saw the ocean, and I am living right next to it! But I spent the whole summer on two islands, and it was great, and I banded birds… . I was very nervous but then my professors were like, ‘Oh it’s more like research, just go, you don’t have any commitments, you just discover things.’ And that’s how I fell in love with it; oh, field research is fun. And I came in with an interest in medicine and now I’m thinking about field medicine sort of thing. Porcia: … Even just walking around campus I can see herring gulls, and when I heard them for the first time in winter I was freaking out. I was like, ‘I know that call.’ … I heard that the entire summer and I know their behavior, and even though this is not Great Duck or Mount Desert Rock where they’re more … wild, they somehow act the same way even here, which is really nice. Banding gulls in the beginning [was] kind of hard for me, because I never grew up with pets, and never had a living thing in my hand. And the first few days when I was taught banding, and how to grab the chick, we had to keep the eyes closed so that they don’t freak out and everything, but it was so scary because I could hear their heart beat. And that [would] go so high and I was like I don’t really want to do this because I’m scaring this little chick. Jenn: You’re afraid you’re going to hurt them? Porcia: Yeah, that was my main scare, I think. And banding is very – you are using pincers to lock the band and it was very scary that I would just sometimes lose my strength or something would happen, but my professor was always there until I got through, until I was comfortable enough. In the first few days I was like, ‘How can you do this to a bird!’ … and I could literally question myself if I should be doing that. But then when I talked to … my professor, John Andersen, and he … told a lot of stories [about] how he felt, and it was a similar way. But he also made us realize it’s important that you do it, because … people are like ‘Oh gulls are pests …, they’re annoying, and they yell all the time,’ but … his data which he collected for more than fifteen/sixteen years showed that the gull population has been declining in the Gulf of Maine, and these two islands are the only two places where the population is stable. … It was interesting, out of eight or nine islands only these two islands where the gull population was stable. J: Do you know why? P: … We still don’t know. But one of the things, at least what happened on Great Duck last year was that Hurricane Arthur came in. Even though it wasn’t a big hit to the mainland we evacuated the island for 3 days or so, and when we went back, the chicks I banded, I found 11 of the banded chicks dead and more than 23 gull chicks dead. And all of them were hypothermic. I didn’t expect it, but I should have thought of it. … They don’t have their waxed feathers yet. They don’t have their primary feathers or secondary feathers. Just down. So it’s very easy to figure out these chicks died because of … hypothermia, and a lot of them were trying to hide inside rock cracks, and most of them were siblings, because we banded them. Usually siblings have the same number, like 24, 23, 22 – they have the same serial numbers, and we also note down which nest these chicks are from so that when we normally go and check on 40 nests at least, and check on the chicks and take their weight and their head-to-beak size and see their growth and how quickly they gain weight or how slowly. Just to keep track of if we have … healthy chicks, and when the hurricane came a lot of chicks died and … I was just … Usually I would go and put on bands, but at that time I was taking off bands. Porcia: So many of them. Jenn: What did the gull parents do during the hurricane? Jenn: Oh no, did you lose them all? Jenn: That must have been devastating, to band them and get to know them and have them all die like that. Porcia: Yeah, and you know chicks. Some of them are so sassy, and you know … there were these two chicks right outside of our house in Mount Desert Rock. I think my friend named two of them Igor and Bruno. … They [didn’t] care if we were there, they just yelled at us, and they [were] right outside the door. And they [were] black-backed chicks, so they are big. Porcia: Yeah. And they are very hostile to other tiny herring gull chicks, and … when it’s very sunny on the boardwalk they try to fly. But they are the laziest chicks. They don’t go hunt even though they know how to fly. And their mom lives right on top of the roof of the doorway. They just beg for food all the time. Jenn: And does she give it to them? Porcia: She does it. But then again, that’s why they go after the herring gull chicks. Jenn: To take their food? Porcia: Yeah, to take their food. If you scare the herring gulls they puke out. They puke out all the food that they store in their necks. Also they, they were just really lazy. But a bully kind of. They were fun too. Igor and Bruno. … One of them got sick at the end of the season. And then we didn’t see him. My friend was also … The same friend who gave them names … She was doing an intertidal study and looking at plankton and stuff. And when she was doing [that] she normally sits outside for the sun to help her look into their slides and stuff … and at that time she forgot her pipette outside. … And next thing you know one of the gull chicks, those two, one of them had taken it in and was running around. So we went after that chick and finally got it out. It was glass. Porcia: It couldn’t swallow it. It was just sticking out of his beak. Porcia: And they’re so hard to catch when they … run. Jenn: They sound kind of like human kids. Jenn: Getting in trouble, putting things in their mouth. Jenn: … How did you end up doing this? Porcia: Well, I took human anatomy class with John Anderson. He studied medicine during his undergraduate years along with ecology and stuff, and I took those two classes, and I wasn’t … I just came from home, and I wasn’t sure if I wanted to go home after a year, because going home is expensive. And it’s kind of far, and I don’t like the plane rides. Jenn: I don’t blame you. Porcia: I don’t like the layovers. They are so long and tiring. I was like … I can do anything. I don’t have any plans. I first got accepted to the Mount Desert Rock thing, but then one of the people who were going to Great Duck dropped out, and they [said], “Do you want to do both islands?” I was like, if it’s possible. So, Mr. Sean Todd, he takes care of Mount Desert Rock. And Mr. John takes care of Great Duck, so Mr. John trained me in the first seven weeks. And I came back for a week or so, and then I went back to Mount Desert Rock until the school started. Jenn: Must have been amazing. Porcia: Yeah. It was such a great experience. … On Great Duck we have an outhouse which we built ourselves. Jenn: I guess you guys did a good job with it. Porcia: Yeah. [The] outhouse always falls apart at the beginning of every season, but this season, it was standing, so we were impressed. Jenn: And what happens to the waste? Porcia: The waste … So, in Great Duck there’s soil. Porcia: But in Mount Desert rock there isn’t. In Mount Desert Rock we have incinerating bathrooms. … Everything just bubbles inside that bathroom once we turn it on. It’s really gross, but you have to do what you have to do. … We collect waste … We have a bathroom, but it’s a bucket bathroom. So, we carry the waste every two days or so. And we put it in an incinerating bathroom. … It’s like a half a day process to burn everything. It just turns into these few grams of carbon. That’s it. Jenn: And you just sprinkle it like soil or something? Porcia: Yeah, and it’s done. Porcia: Yeah, Mount Desert Rock only has some seaside rose. Is that what people call them? Porcia: Yeah, the rugosas, the Chinese rugosas, and Mount Desert Rock only has two colors, one color actually. It only has dark pink and pink, I think. But Great Duck has white ones and pink and all of them. But Great Duck is vegetated and Mount Desert is not. Jenn: How did the roses get out there? Porcia: We have no idea. It’s very interesting … And also the roses are always closer to the house area, toward the ledges there aren’t many. Jenn: I wonder if the keeper planted them. Porcia: Yeah, probably. As far as I know the gulls didn’t nest there when the lighthouse keeper was there because he had a dog. … I think once they [left] the gulls started nesting there. Maybe the gulls nested there all the time, like, before humans came there. Porcia: And then there was a dog, and there was a brief moment where there [weren’t] any gulls. But there are many gulls there now. And normally by the time we get to Mount Desert Rock it’s sort of like the ending season of herring gull nesting and nesting season. By that time all the black-backs are big, and they only hang out in the ledges. But the herring gulls are the ones who hang out closer towards the house, and they’re still growing, still feeding. Jenn: So this is, what, June? Porcia: … No, this is the beginning of August. Jenn: Oh, okay. So you go out there pretty late. Porcia: Yeah. Great Duck is from June to end of July. … And then we start Mount Desert Rock until the beginning of September. Jenn: Are the gulls annoyed when you get there? Porcia: They scream a lot. One of the things, when we go out to the field, it’s very exhausting to catch the chick, yes? But the other exhausting part is to handle the parents. It’s very difficult because they dive bomb on you, and it hurts really bad. … They aim for the head. Jenn: Are they hitting you with their beaks? Porcia: They come down with their beaks but they scratch with their claws. Jenn: Ow, that would hurt. Porcia: But they do hit the eagles with the beaks when the eagles come in. But the eagles are mostly there in Great Duck. Jenn: Are there a lot of eagles? Porcia: The bald eagle nesting site … There’s a tiny island [near Great Duck] called Little Duck where the eagles nest. And one of Mr. John’s projects, or his long term project was to look at the gull and the eagle and how they interact. And when the eagle comes to the gull colony, … the entire gull colony goes up to the sky. … They’re everywhere. And they scream so much that even though we’re sitting inside talking and playing music while cooking you can hear the gulls scream. Porcia: So, once we hear that we’re like, there’s an eagle. And we go out and with our binoculars, we try to find the eagle and see if it took any chicks or not. Normally we note down all of the eagle sightings, too. There were many eagle sightings this year, and mostly it’s parents and juveniles. Sometimes the juveniles come along with their parents when the eagle is teaching their young ones to hunt. Just a few years ago one of the students, Kate Shlepr, … found a relation in which the eagle sighting went up but the gull population went down. Jenn: The gulls are leaving or getting eaten? Porcia: Getting eaten, actually. 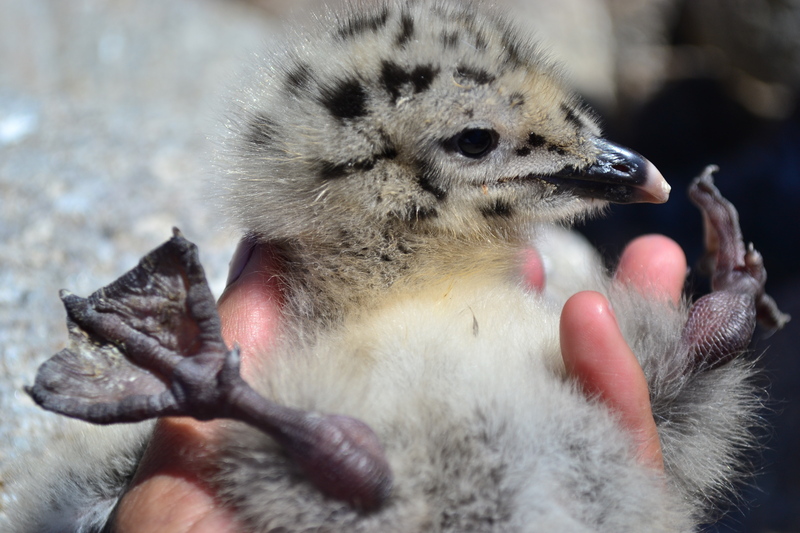 One of the times when I was banding the east side of the research station …, I went one afternoon because I didn’t have much to do, so I just went to find chicks. … I was looking for the chicks, running after them, and I finally catch [one], and I look up, and the whole colony’s up. I was like, wait, this is not [because of] me, what happened? It’s a different feeling when you’re … in the middle of it when everyone goes up. It’s different when you … sit there in the house and look for the eagle. There’s a difference between where you are. Jenn: Like being inside of a storm? Porcia: Yeah. … When you’re inside the gull colony, and the eagles come in, [as opposed to] when you’re outside the gull colony when the eagles come in. I think I became much more frazzled. I got so much more tense myself when all the gulls went up. I’m like, wait, what did I do? I just caught a chick. I do this every single day. The only gulls that are chasing after me are the parents. Next thing I didn’t see anything, I’m still searching, and this black thing just goes up, and it was just ten meters away from me, and it caught a chick and went away. It was a juvenile. It was so big. And that was the first time I saw an eagle that up close. It’s kind of crazy. Jenn: So they’re after the chicks and not the parents? Porcia: The parents are very – they will go after the eagle. Most of the times … That was only the first time I saw an eagle catch a chick. But most of the time they have failed attempts in which all the parents go after the eagle and they dive bomb on their head and … they hit with their beaks. And that really hurts, because the eagle goes haywire when it’s flying. It just goes in the wrong direction and comes back. The eagles are very persistent too. Until and unless they go away from the colony, [the gulls] keep going after the eagle. … At least three or four gulls go after one eagle until the very end, until it goes all the way to Little Duck. And these eagles are very sneaky, too. In the research area, the southern end, there aren’t … [many] trees, but there’s a huge patch of trees in the middle of the island, and it’s very dense. And that’s the place where the eagle just looks at the gull chicks, from a distance, and once it has an in, then it goes after [the chick.] Always at the end of the season it’s that one vertical patch of trees where the eagles come in. Jenn: So, how many gulls are in these colonies? How big is it? Porcia: At least 1,000 pairs, I would say. Jenn: Oh my gosh. I had no idea it was that big. That must be incredible when they’re all up in the air. Porcia: But there are two colonies … I mean, there are many colonies [that] for our own research purposes we divided into different colonies. But mostly it’s the north end and the south end. And when we count the south end sometimes we get about 600 gulls. And every morning 7:00 we do counts. … So, it’s safe to say 1,000 pairs. Jenn: Wow. And the same on Mount Desert Rock? Porcia: Mount Desert Rock has around 600, 700 gulls. I also brought my field book. I realized that I ran out of pages. This was my field book from this season. So, we would always have counts every morning. Porcia: Herring gulls, black-backed gulls, eiders, guillemots. All six, seven of us who are on the island have to wake up by 7:00. Mr. John give us the wake up call in that small staircase that we have, … “It’s 7:00, everyone come to the tower, another day in paradise,” and we’re like, ‘Oh no, we just went to sleep.’ But we have to be up in the tower by 7:00. And [during] the tower count, we count every single bird species we see and then we consult with each other and our numbers and take the best ones. These were all the head to beak counts. For my project on Mount Desert in which I still need to decide how to analyze the data, this was how I divided the island, was going to look at the island. Just sectioning the island. Porcia: It’s an oval shaped island. So now if you go there there are yellow dots in four different directions that I made every ten meters on the rock. Jenn: Oh, cool. So, you can kind of orient yourself. Porcia: Because Great Duck is big, and you would think that it’s much harder to count gulls, but Mount Desert Rock is, if you go up the tower, is right in the middle. So, you get overwhelmed with the number of white dots you see. … It’s very difficult to count and [there are no] landmarks. At least in Great Duck we’re like, oh, there’s the tower house, and the [generator] shed, and from gen shed to that corner it’s this many gulls. We can divide it. Porcia: I got so frustrated and overwhelmed the first day I was counting up from the tower. I have to divide this area, or else it’s very hard. And all these marks are from the banding. … We have two kind of bands. One is the metal bands and the other is the plastic bands. The metal bands are the federal bands, and the plastic bands are more, it signifies the area where they come from. … If you see a gull with a blue band or a black band and you know the number in it, and number are very big and only three letters, then you can go onto the banding [web]site, the government banding site, and write the number and you’ll know where that chick was born and where it was banded. In Great Duck last season we had adult gulls that [were] nesting and one was from 2009 or 2012, but it was at least four years older. The bird came back to where it was banded in Mount Desert Rock, and it was “A” something. And that was the first batch of color bands that we had banded. So, it came back to Great Duck to nest this year. And had a chick, two chicks actually. Had two chicks, one of them was fine, the other had a broken wing. I don’t know if the chick survived, but it was alive until the last day we left. But that gull has come back, and we had an adult with a black band. …He was from the Isle of Shoals. …This winter, I think we heard back from the banding agency twice, and the first time they found a gull in Connecticut. Some bird enthusiast there was looking at this chick and he noted down the number on his metal band, which is a lot tinier. And he’s like, “Oh, we have seen your bird. It’s healthy.” He even sent us a picture of it. Jenn: Oh my gosh. Like baby pictures. Porcia: Yeah. It’s a year old and it’s fat. We just banded it from Mount Desert Rock. Another bird from Mount Desert Rock was found in New York State. Jenn: How far do the gulls go? Porcia: They do go down to Florida and warmer places. Jenn: I didn’t realize that herring gulls migrated. Porcia: The islands go away. The whole of the colony goes away at the same time, or similar time. We were kind of surprised to see eggs yesterday. There were 38 nests and at least ten of them had three eggs in one nest. Jenn: So, is that early? Porcia: Yeah. It was pretty early, because normally the black-backed are the ones which nest earlier, but there were only six black-backed nests that I saw. And all of them had three eggs. And there were a lot of color differences in the eggs, too, which I wonder why. I’ve yet to ask my professor, but there were the ones that were like heavily spotted black, [and] there were the ones which were like eider eggs, very white. Like duck eggs. I was like, “Oh, interesting.” But one of the things that people will find different in the two islands is the nesting material. The ones in Mount Desert Rock mostly have seaweed in all of them. Jenn: Oh, that makes sense. Porcia: Yeah. And the ones in Great Duck have hay kind of thing, like … dried twigs and grass. Some of the nests, I think these are just first year parents or so, they lay their eggs on bare rock. Jenn: That’s kind of dangerous. Porcia: Yeah. And they clearly would not survive. Last year one of the things I saw, … that I noticed personally was it was very easy for eggs to break on Mount Desert Rock, because they would just tumble and fall, and it’s just rocks. But in Great Duck gulls also nest around the vegetation. … There are more crevices for the nests to hold the eggs. And just yesterday too I found a few eggs that just cracked, just because they fell. Jenn: That’s just sad. All that work. Porcia: I know, yeah. But gulls, they are very easy to … If they have invested a lot, they do cry or feel sad. Porcia: They do look for the chick even though they know sometimes. The parent just sits in the nest even though it knows its chick is dead. Because the dead chick is right on the nest. It still sits there. Porcia: Because it has had a long investment in that chick. But some parents, if it’s … a day or two old chick, if they die they just leave. Also, eggs, when they crack and stuff, they just leave it. Jenn: Do they ever lay another round of eggs? Porcia: … Black-backs are another predatory birds on the herring gulls. … Herring gull chicks are easy food. Porcia: And they nest right next to them. So we have had this pair of black-backs in Great Duck. 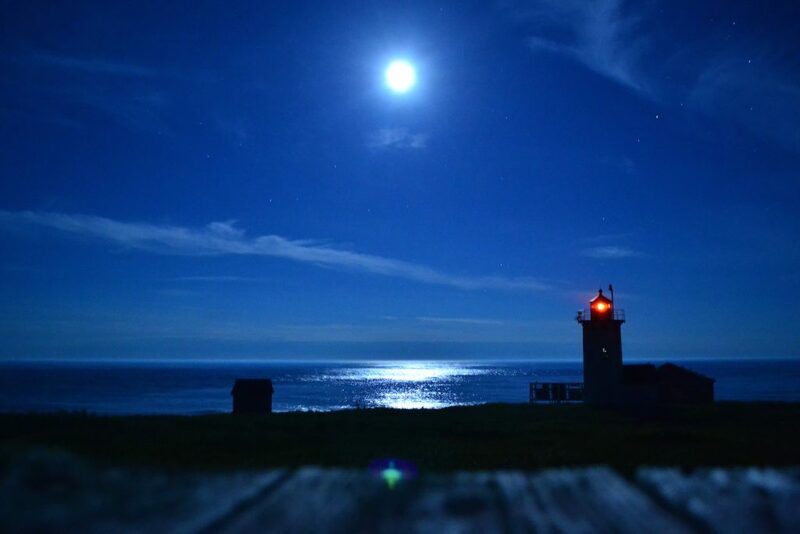 It’s right in front of the tower and next to the generator shed where also our foghorn is. Normally we don’t go near that because Mr. John yells at us, “Don’t go there.” But all the chicks go there when we come for them! They know we don’t go there so they go there. 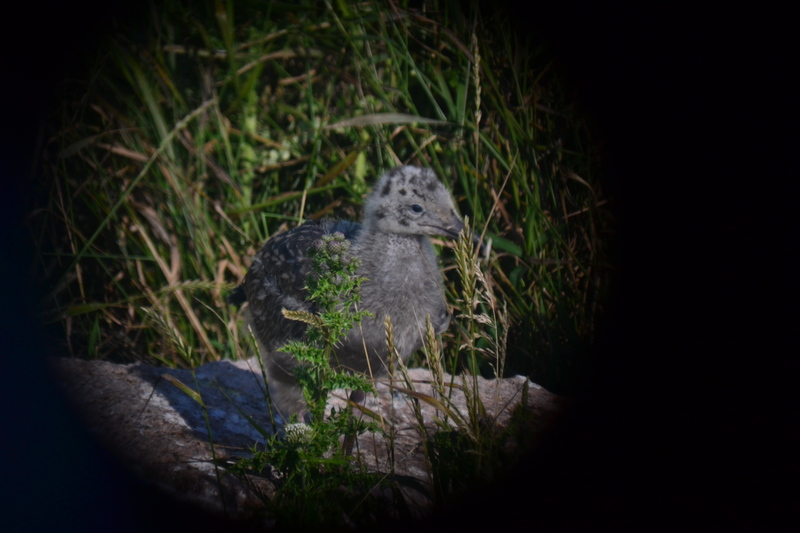 This black-back chick there … The parents go psychotic at the end of the season and start killing all the herring gull chicks. And they start feeding their chicks. And it’s interesting how in that place, it’s like a ledge, and there’s herring gull nests around, and there’s a black-back nest right in the middle. I was just … The day when I saw the black-back eat the chicks was the same day when I saw a seal eat an eider chick. Both things [were] happening at the same time, in the evening. Porcia: I have never seen that, I was just like … Mr. John was on the island and I was telling him, and he’s like, “Wait, I think it’s the same family that did the same thing last year.” And he came up, and it is the same one. Just a week ago they went back, and Mr. John was like, “They’re still there.” They’re nesting there this year too. Jenn: And the herring gulls haven’t figured this out? Jenn: That the black-backs are going to eat them at the end of the season? Porcia: Oh, it’s just that … I think no matter what the herring gulls do, they can’t defend their chicks when the black-backs attack. Because the black-backs are big. I think when I saw the chicks get eaten, it was only one parent, one herring gull parent that was defending against it. But it was both the black-back parents. One was after the chick and the other one was after the parents. Jenn: Maybe the herring gulls there figured out they need a little space. Porcia: Oh, yeah. But the herring gulls themselves are very territorial. I am very scared when I go on field that [I might] displace a chick too far from its nest. Herring gulls are very territorial, and if another chick comes to their nest they will kill that chick. Even tiny chicks. They kill them. They peck on them. One of the chicks on Mount Desert Rock, it was right next to the house. I kept track of it, and it survived at the end of the season, but I think it moved to the wrong nest one day, and it was pecked so badly that half of his face was bloodied. Porcia: I saw it from the tower, and then I didn’t know if I should go or not, and then I just went and grabbed the chick, and I was going to band it, but I was like, I don’t think I should band it. Maybe it won’t survive. Jenn: You could see the skull? Porcia: Yeah, I could see the skull. But that chick was always guarded by the parent leader after I noticed it. Jenn: Flip flops. I find flip flops all the time. Porcia: Yeah. Do people just throw it out in the ocean? Jenn: I think they wash off boats. I think people do throw stuff in the ocean, but a lot of it is just lost. Porcia: And a lot of buoys, which I understand. Jenn: Yeah, those just get washed up. Porcia: But there’s random things that come. And one time we found a shoe. Mr. John had just ripped his shoe, and it was his size. … He didn’t wear it though. Porcia: I don’t know. … It was New Balance company. That’s all I remember. It was white and blue. On Mount Desert Rock, there [is] random plastic stuff everywhere. One day I was looking up from the binoculars, counting the chicks on the sections. There [was] this chick who had a red plastic band on its neck. I tried going after it, but it [would] just, like, fly. Two or three days passed. I tried to catch that chick. Next day, my friend is like, “I think I found the band. I think I found the plastic ring [that was] on his neck.” So, it took it off. Porcia: [But the next day it] was trying to get it [back on]. So, I went back and grabbed the plastic band and brought it all the way to here. Jenn: You think it was putting it on on purpose? Porcia: I have no idea. It had very razor sharp edges in the rim. It’s just weird. Maybe it will make them look cool. I don’t know. Porcia: In the chick colony. Porcia: Yeah. Chicks are funny. Jenn: You get kind of attached to them? Porcia: Yeah. They’re funny. But they’re fun.